My third graders due a huge unit on instruments of the orchestra. In Kindergarten through Second grades we discuss instruments as they come up in pieces we are listening too. We spend time learning to identify classroom percussion instruments and classify them. Third grade we really hit it hard and work to learn instrument names, their correct spelling, instrument families and how to identify them aurally. This year I chose Instruments of the Orchestra as the content for the SLOs that I am recording. SLOs are student learning objectives. We are required to pretest and post-test and record the data for analysis. After spending a week on each instrument family, my students work in centers to review and prepare for their test at the end of the unit. 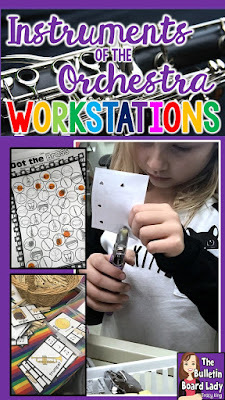 Here are the workstations they completed. At this station, students review instruments and their names as they determine how many syllables are in each instrument name. Then they take a clothespin and pin the note or rhythm that most closely matches the syllable of the instrument. This is mostly rhythm work, but this is an opportunity for students to see a picture of the instrument and the instrument name. You can get this Instrument Clip It here. I think that I may love dabbers more than my students! I am always looking for ways to incorporate them into center time. 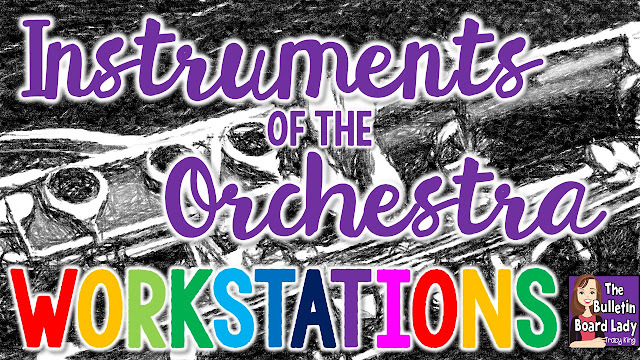 At this station students had four worksheets to complete (one for each instrument family). Students dabbed instruments belonging in each family. So fun! You can get this dabber set HERE. Some of the dabber pages needed a little bit of time to dry. We laid them on our seats and by the time most students had rotated through all of the stations, their papers were dry and ready to go home to hang on the fridge. "Is it a member of the brass family?" "Does it use a reed?" "Do you scrape it to make a sound?" "Is it bigger than my arm?" How awesome is that? I love that this center allows them to really think about what each instrument looks like and helps them come up with ways to describe their characteristics. This station is SO much fun! I have a collection of hole punches. Some have stars, hearts, music notes or the original circle. At this center, students complete four punch cards (one for each family). On each card they are asked to punch the instruments for a specific family. You can download the cards HERE. In my classroom, this station worked out best to be a standing station. I used an empty cart and placed supplies on it. Students stood around the cart to complete their center work. Most students really enjoyed this opportunity to stretch their legs. I will definitely add more standing stations in the future. Similar to Instrument Clip It, the instrumental version of Rap It, Clap It, Music Match It asks students to sort instruments by the number of syllables in their name. You can grab this set HERE. I always like to include a reading station if time and space allow. At this station students sat on the carpet and read books. I really wanted to include only books about instruments, but just don't feel like I have enough in my library yet. I included books about composers and a few seasonal books too. Mystery Instruments A brown paper bag, a classroom instrument and a detective sheet. Apps to Try: JazzyABCs, Garage Band, Virtual Drums, Mini Harp, Music Keys, Piano Pals.